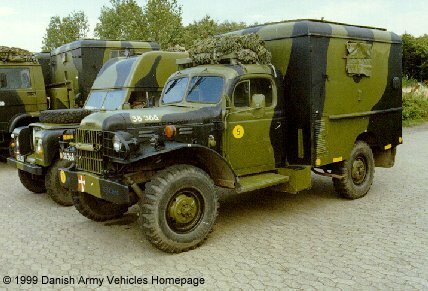 Danish Army Specific: Danish Army body-work on US-supplied military version of Dodge Power Wagon chassis, usually with a 2.000 kg capacity winch. 600 units were bought between 1962 and 1967. Shown is the electronic warfare version. Just visible behind is a Landrover 109 with Sylvania Automatic Telephone Exchange. All superseded by MAN 8.136, VW LT35, Mercedes GD etc. Historical: Production of the Power Wagon started in November 1945 and continued until 1968. Developed through this period with synchromesh transmission (1955), power steering as option (1956), Braden winch as option (1958) and a larger engine in 1961. Also known as the M601 or T137 series. When production ended some 73.000 vehicles had been produced. Small numbers were produced until 1978, but for export only. Length: 5.03 m (196 inches). Width: 2.20 m (85 inches). Height: 2.66 m (103 inches). Weight: 4.300 kg (9.460 lb.). Engine: Dodge 6-cylinder, 4.113 cm3 (250 cubic inches) displacement, liquid cooled, carburettor. Horsepower: 115 at 3.600 rpm. Transmission: 4-speed gearbox, New Process type 420. Transfer case: 2 speed, New Process type 39360. Electrical system: 12/24 volt, negative ground. Fuel capacity: 104 liter (23 gallons). Range: 275 km (171 miles). Dodge W300M tele-type van (96 kb).